During a transition period, things could go terribly wrong. You should have a fall back plan in case business does not run as smoothly as expected in your new location. Set a time limit within which business should have picked in the new area so that you can close shop in the old location. Each state has different laws and regulations for companies performing their business there. Take your time to go through the rules of the state in which your business is relocating. Make sure that you obtain the relevant licenses authorizing you to operate and continue with your business as usual. Also, understand the tax implications of such a move so that you do not end up on the wrong side of the tax authorities. In addition to that, get to know about the culture and habits of the people who live there to avoid getting into trouble unnecessarily. Moving to a new location means that your business will now have a new address. It is paramount that you communicate this change to your clients as quickly and efficiently as possible so that you do not lose them to your competitors. Such notice should be placed in a public document such as in a newspaper or television advert. On a more personal note, you should email all the contacts in your client list informing them of the change and apologizing for any inconveniences caused. Maintain your current phone number just in case a client tries to get a hold of you. That way they can still be able to reach you even if you have changed your address. A business cannot run smoothly without employees. Before you move, you have to consider the implication it will have on your staff. Are they in a position to move with you? If not, will they be able to commute all the way to the new location and back home? 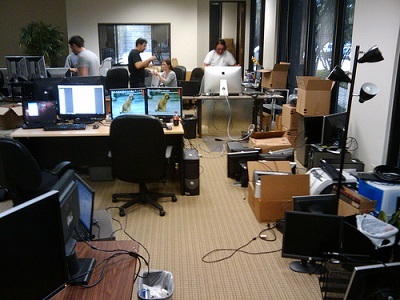 If at all your employees are not willing to move with the business, consider hiring new employees in your new location. You will have to live with the fact that you will lose some of your best employees, and replacing them is quite tasking. Factor in the costs of hiring and training new employees as well as relocating the old ones who are willing to move. As a business, your sole purpose is to make profits. So, it is important that you have an efficient mechanism of receiving and depositing money. Banks in different states have different rules and policies, and you should have the proper knowledge of what your bank requires of you in such a situation. Make the necessary changes in your accounts and inform your clients of the same to avoid confusion. At the end of the day, you will be able to pull this off successfully if you lay down a proper and strategic plan before executing it. Enjoy a successful business relocation, folks!